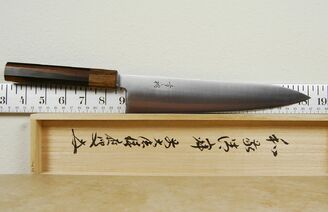 Konosuke is a name that reverberates with most knife lovers. Their reputation for fit and finish is equaled by the outstanding grinds and edges that the various blacksmiths give these much loved blades. The owners of Konosuke have curated one of the finest lines of kitchen cutlery spanning the extremes of price and exclusivity, but without ever taking their eyes off the brand�s hallmark levels of quality in every regard. The steel used in this knife is derived from some of the best iron in the world. Featuring a fine grain structure and low contaminant content, these blades are hardened to 60-61 HRC. They are stamped from a single piece of metal and given a grind that truly defines the laser nomenclature. Edge retention and overall durability are hallmarks of these knives. 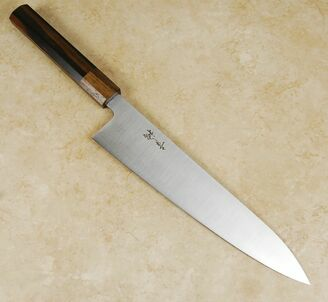 But the ability to slice with consummate ease and control are the real qualities that knife lovers attribute to the line. 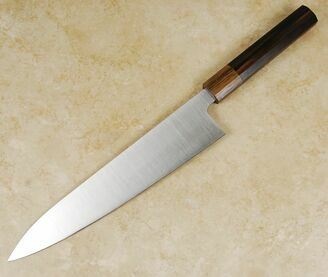 In keeping with these standards they have added the much loved Khii ebony handle to this outstanding blade. The slightly narrower profile is a perfect match to the thin blade and endows the knife with a fine balance, extraordinary level of control, and a look to die for! The Swedish Stainless Gyuto 240mm Ebony knife is the epitome of all that the Konosuke brand stands for. Highly recommended.